Thursday, June 20, departing at 8:00am (7:30am from the subway). Cost: ¥420 / ¥380 for members; Difficulty Level 3+. In Brief: An easier version of one of our tough Great Wall hikes in Yanqing District – the same great scenery, but less of the steep climbs up and down. 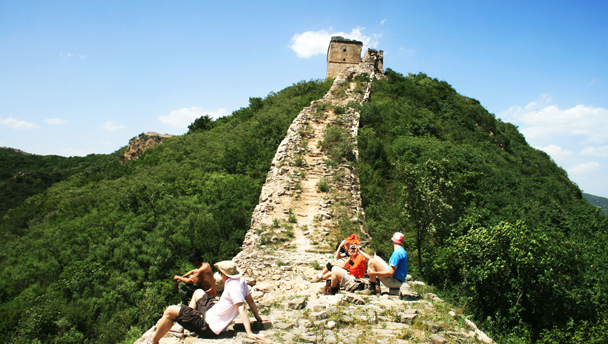 Hikers sitting on the unrestored wild wall below a Great Wall tower. 3–4 hours start to finish over 6km. Bring your passport / ID card (or a copy) with you on this hike in case the border crossing guards decide they want to check us on the way out. This stretch of Great Wall in Yanqing County is extremely picturesque and seldom visited, but the steepness of it makes it difficult for casual hikers. On this visit we’ll do the ‘middle route,’ cutting out the toughest parts to make it a little easier. There are still some steep climbs to do, but overall this hike isn’t long enough to rate as difficult - we’ll take our time climbing up and down and make sure that we have a relaxed and enjoyable visit. We’ll begin this hike with a slow climb up a winding valley, passing rocks and old terraces on the way to the dirt trail that will lead us to the Great Wall. On one side, the wall comes down a steep hill; we’ll follow it the other way, passing through a tower and taking our time to climb the steps of this section. As we get to the top of that part, we’ll see the road we drove in on, far below, as well more of the Great Wall in the area, including the ‘General’s Tower’ that is the highest point of the hike. During peak season, the General’s Tower may double as a shop – we’ve yet to see it in service, but inside is a bench, and a sign that reads “1 yuan to use” the shaky ladder which is now the only way to enjoy the views from the top of the tower. To reach the General’s Tower, we will do a few more descents and ascents along the wall, climbing steps up and down. From the General’s Tower the hike gets much easier, as the wall starts to follow a ridgeline instead of running up and down the sides of valleys. We’ll do some hillside detours around the steep and slippery parts until we reach the trail that will lead us back down to the valley and the bus, and the countryside restaurant where we’ll get our lunch. It’s not a very long hike, but parts of it are rather steep. We occasionally meet bad traffic on the way, going through the Badaling pass. 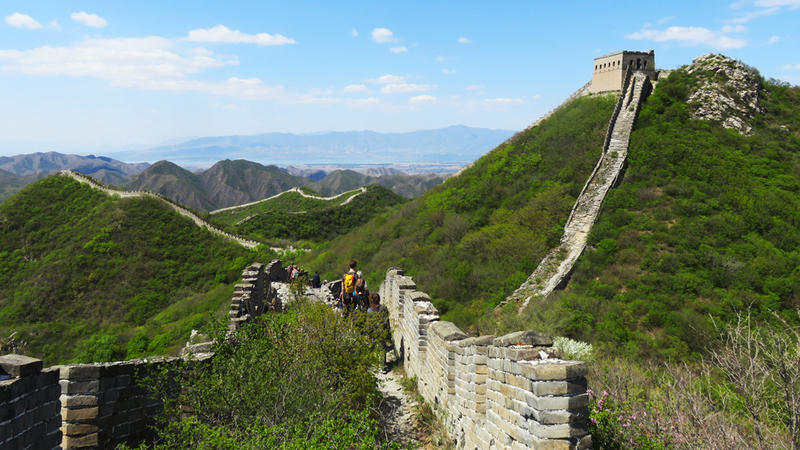 See the scenery from a hike along the Middle Route of the Switchback Great Wall—lots of greenery, blue skies, and long views of the Great Wall. See 23 photos from a hike along the Middle Route of the Switchback Great Wall—grey skies but good views, especially of the wild peach flowers. See 17 photos from a wild section of Great Wall in Beijing’s northwest. Ten photos of Great Wall, green hills, and blue skies, from our hike along the Switchback Great Wall. Twenty-plus photos from a hike along ‘wild’ Great Wall in Yanqing County. 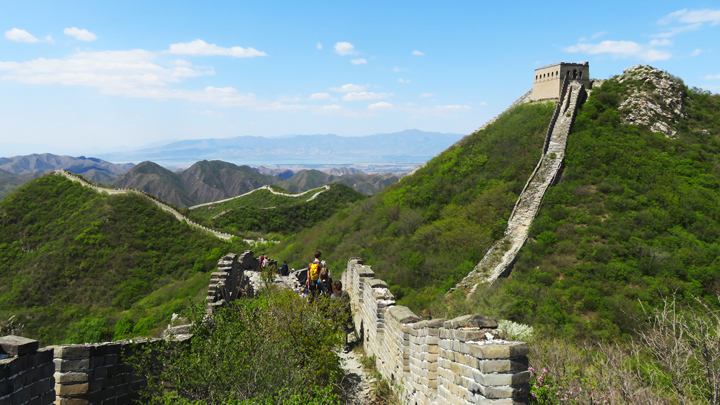 Photos from a short hike along a rough but pretty line of Great Wall in Beijing’s northwest. Nineteen photos from a hike along the middle route of the Switchback Great Wall on a windy and snowy day.